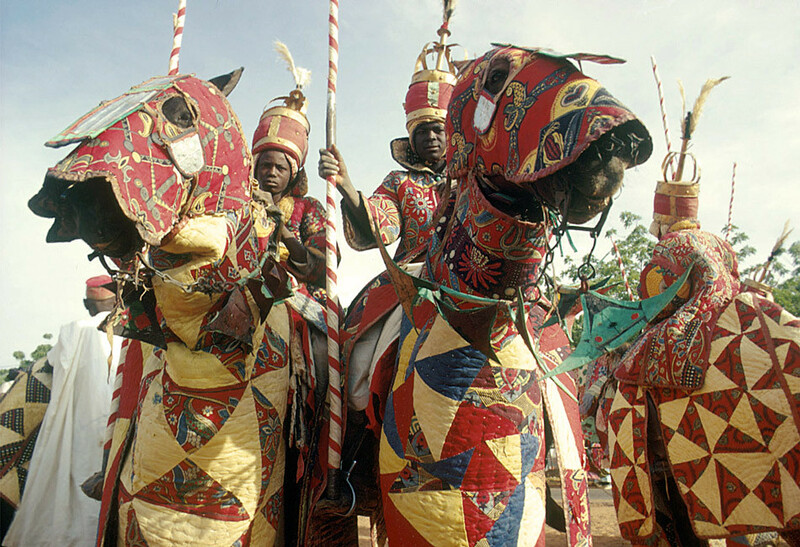 Hausa armed horsemen in quilted armour during 10th anniversary of independence celebration, Niamey, Niger, [colour slide by Eliot Elisofon, 1971]. "Heavy garments of quilted cotton cloth stuffed with capok were widely used as armour for horse and man in central and eastern Sudanic Africa. 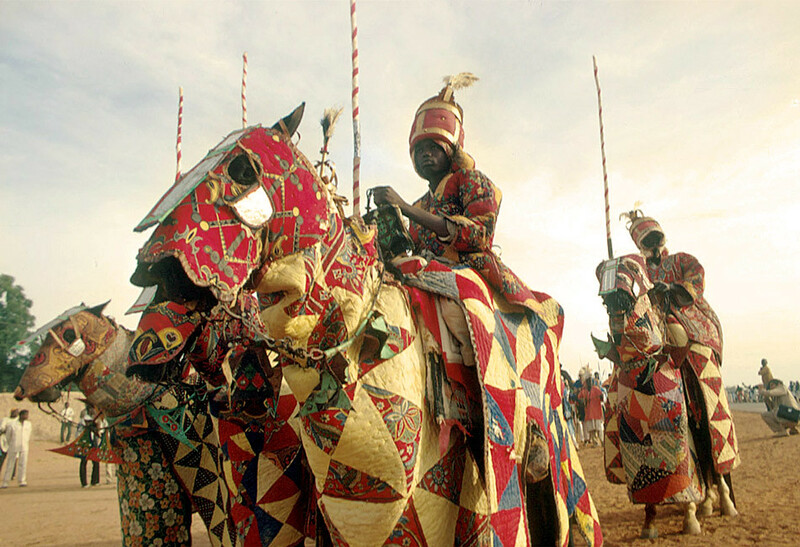 In the Sokoto caliphate of northern Nigeria, heavily armed horsemen in quilted armour were known as Yan Lifida. 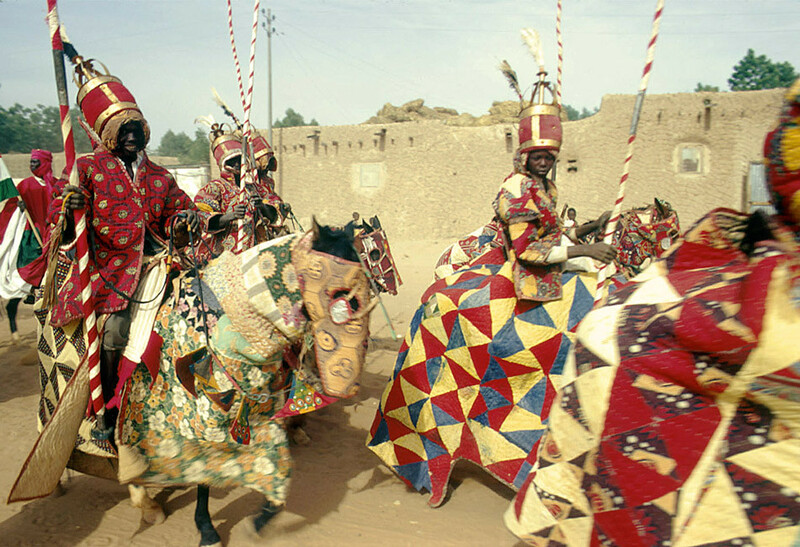 They often acted as the bodyguards of an Emir on the field. The various components which formed the armour are: the bantan lifidi covered the loins and abdomen; the safa the upper torso; the kumakumi was worn as a corselet; Such quilted armour was used either alone or in combination with chain mail (sulke). The war-horses themselves were sometimes outfitted with breastplates (dan gaba) as well. The helmet (kwalkwali) was a padded headpiece made of bound rags, sometimes covered by a tin or brass receptacle or chain mail, and decorated with the feathers of an ostrich or other brightly colored bird." [Ch. Spring, 1993: African Arms and Armour. British Museum press]. This photograph was taken when Eliot Elisofon was on assignment for Westinghouse Film and traveled to Africa from October 26, 1970 to end of March 1971.